I’d planned to talk about religion and science. I have a million examples (endless really) of religion refusing to accept evidence right in front of their face (evolution, global warming) but fewer or science, although they certainly exist. And I wanted to talk about the Temple Foundation again, an organization that says it seeks to bring the two sides together (religion and science). But then I woke up and Buddy had stopped eating again, and that was that for my day. He’s scheduled for an ultra-sound on Monday. Meanwhile, I gave him sub-q fluids, some Pepcid, and he just ate a little so I feel up to a brief post. To explain my absence, basically. On my way to pick up a variety of foods to get Buddy to eat, I stopped at a church to interview a guy who works there who had rescued a pigeon who was caught in a tree in front of the church. I asked him if he felt like a hero, thinking he wouldn’t admit to something like that, but he said, “Yeah. I did.” To help a creature who is in trouble feels good, no doubt about it. 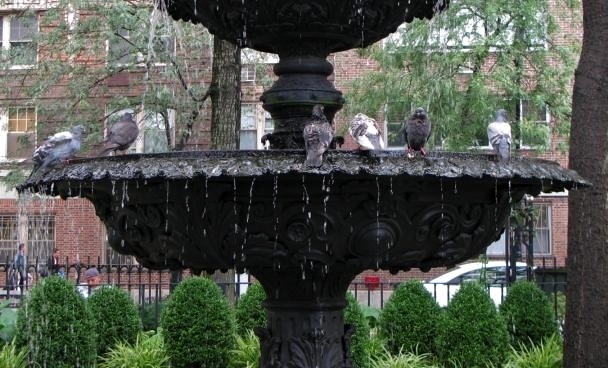 Pigeons in a city fountain. Bela, Dona and I are sending healing thoughts to Buddy and comforting ones to you. It really casts a pall over everything when our feline companions are sick I know. Just hold him close tonight and tomorrow and let him know that he’s surrounded by love. An Great Lake of love. I’m sure Buddy is aware of how much you care about him. So many others care about him too, thanks to your blog. Just hang out with him and he’ll feel comforted. Get well soon little kitty! Warm hugs to Buddy and Finney and their mother. I wish all of you a peaceful, restful night and a really good Monday! It’s hard to feel so desperate and helpless. You’re a good cat-mom, and Buddy’s doing his best to get better. Hugs and love to the three of you! Hang in there little Buddy! We are all rooting for you! PS. This weekend I watched the 2010 Munk Debate between Tony Blair and Christopher Hitchens on “is religion a force for good in the world”. Not really about science vs religion, but a fascinating watch in any case. I think you would enjoy it. Just google Munk Debates. Thinking of Buddy, and of you. Thank you all for the kind thoughts and best wishes. I should have some information today. Still anxiously waiting.